Someone on here was asking a few months ago how bad the damage to 4239 post collision was. Found this on Instagram. Not easily. What does kind of surprise me though is that it looks like it's still sitting on the rebuilt trucks that only had two weeks use on them. If the ALRVs were likely to come back and I was running the show, I'd have gotten the car jacked up and put a set of junk trucks under it and saved the overhauled ones for spares but it's academic since the ALRVs probably aren't coming back and I definitely do not run the show! They probably will save any salvageable parts. Would have taken a couple of body technicians working on it part time a while but it was repairable according to a retired technician who took a good look at it. The body damage was significant but no electronics or circuitry was really damaged. Unfortunately, it was bad timing. The service schedule states that there are 10 alrvs running at rushhour service. I think the ALRVs will have a farewell run. It would be sad to let the ALRVs go like this. 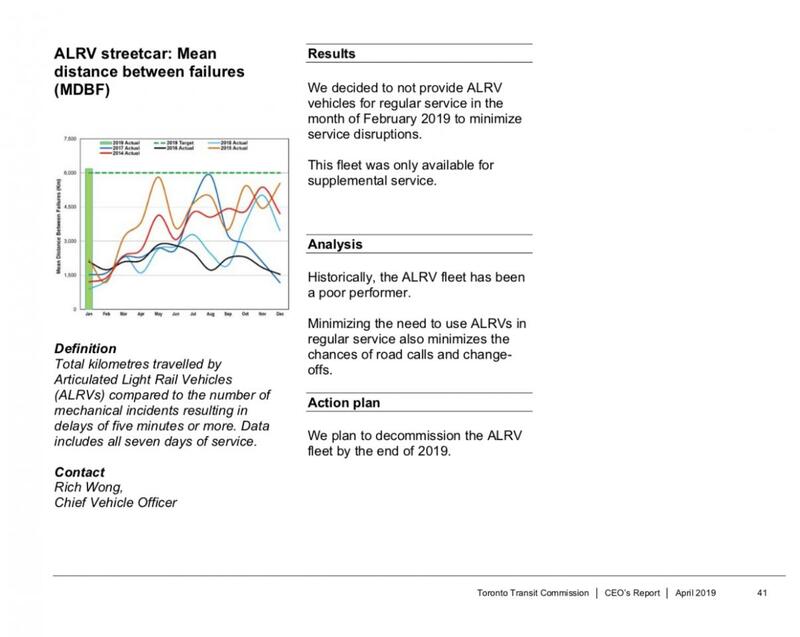 Also the service schedule states that there are 10 alrvs running at rushhour service. If the plans to reactivate the ALRVs are successful, and the repairs take, then I don't see why they wouldn't host a farewell trip for them. If they don't end up coming back into service, they assuredly won't reactivate one for a couple of hours just so that some buffs can get their final rides. What is written in the service summary and what is reality doesn't always have to be the same. Despite what the schedule calls for, I don't see any out in service right now. I guess that answers my question if any ALRV has made it out this board period. The folk wisdom that "a bus at the stop is worth two on the schedule" has to be updated to "an ALRV at the stop is worth infinitely more than everything you see on the Service Summary". 4084 has been moved to Hillcrest. This unit hasn't run since February 11 on the 506. 4132 has gone MIA since March 17. 4002 is tracking in Brampton near Dixie rd and the 407. Is it retired? It was last in service three hours ago. You'd be surprised at the places vehicles can track when the GPS can't find its coordinates. For anyone who is using the trackers, the site offers a number of features that allow you to gain insights about the status of the vehicle. Enable the two boxes screenshotted below and you'll be able to see when the vehicle last reported a GPS location, and when the vehicle last ran signed into a service (trip path). It's not 100% reliable, but it should go a long way towards easing questions like this down the line. 4143 is out on the 506 this morning. I was passing by Russel and snapped a pic of the death row tracks from the Eastern Ave side if anyone is interested. Why is 4226 still powered? WTF I just saw a post about 4221 on the 506? This will definitely not be today. The car is photoed at the loading dock at Main (note that the tracks are right by the platform instead of on the other side of the station where they're right by the edge of property), therefore that would mean this photo was taken at sunset which hasn't occured yet. Plus the weather's been crap all day. 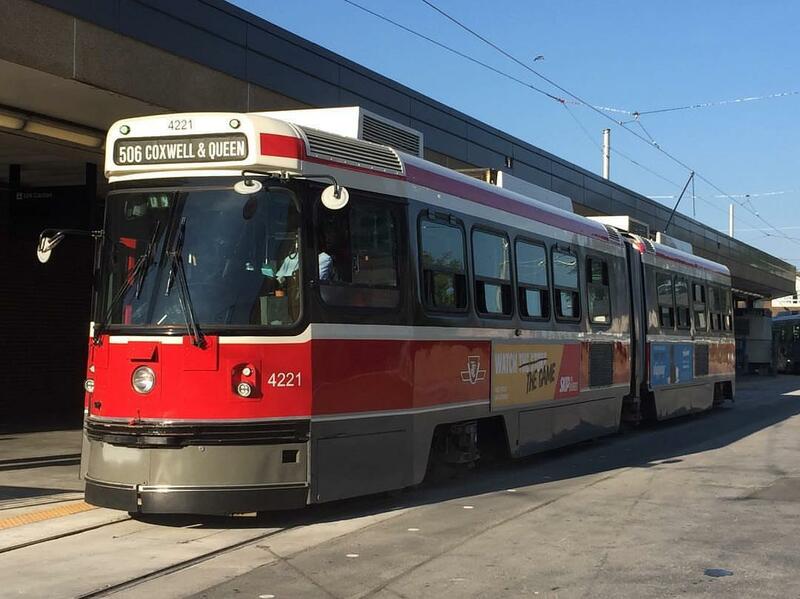 My theory is that this is a photo from early September, I saw a photo the other day of the car operating on the 506 a few days after the TTS charter. It would align with the state of the car's paintjob, which is shiny in the photo and I highly doubt it would be after being stored outdoors all winter long. Edit: after cross referencing the photos from the charter with the ads the car was wearing, I can definitely conclude that that is not a recent photo. 4080 and 4126 have been hauled away today. And is 4230 retired or not ?? I heard that it was but now it is also tracking again at Russel?? The car was reported as being stripped earlier in the thread. However, going by the photos I took of it most recently, it doesn't appear to have been stripped , so that and the recent reactivation of its tracker has lead me to remove its retired status pending further info. Damn right. It isn't stripped until someone gets out their tools and goes to town while the appropriate music's blasting.